Take a tour around Yerevan to explore the city whose history dates back to the 8th century BC. The Armenian capital which was previously named Erebuni was founded in 782 BC by king Argishti I and was designed as a great administrative and religious centre, a fully royal capital. Ancient Yerevan played a considerable role in economic and political life of Armenia for many years as it stood on the crossroads of caravan routes and was a major centre of trade. Visit Erebuni museum to see the ancient Yerevan and to learn about the life, tastes and habits of its inhabitants. 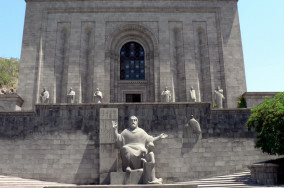 To make your trip to Yerevan a truly great one, do not miss out Matenadaran – a world-class museum and a unique treasure trove holding one of the world’s richest depositories of ancient manuscripts and books. Founded at the upper end of the center of Yerevan, Matenadaran is the pride of Armenian culture rich in historical resonance and inspiration that never fails to dazzle both locals and international travelers. The main objective of the museum is to preserve, restore and reproduce the manuscripts and to distribute and publish particularly historically significant manuscripts in languages other than Armenian. You will then visit Tsitsernakaberd to see the Armenian Genocide memorial complex dedicated to the victims of 1.5 million Armenians who perished in the first genocide of the 20th century, at the hands of the Turkish government. The mentioned prices are with 10 % Sale for the guests of Picnichotels and are valid if you depart from Yerevan . The time of the departure can be chosen by our guests.